The No 523 is truly first-class linestage, excellent phono stage and impressive head amp. Mark Levinson hardly needs an introduction. I don't mean the man Mark Levinson, the audiophile and engineer who started building and selling audio components in 1972, back when the term "high-end audio" had hardly entered the lexicon. I mean the company Mark Levinson, which came into being in 1980 when Mark Levinson, the man, sold his company. Even though the company was no longer owned by the man Mark Levinson, the Mark Levinson brand did, and still has, a reputation for designing and selling very high-quality components. This remained a fact, despite changing hands a number of times. Although it operates independently it is now owned by Harman International Industries, which owns and markets over 20 brands, including Harman/Kardon, Crown Audio, Infinity, JBL, Lexicon, Revel, Soundcraft, Studer and of course, Mark Levinson (which in this review I'll sometimes call simply Levinson, with all due respect). After all these years, the Mark Levinson brand still has an excellent reputation with audiophiles and others, many of whom simply want "the best". If Mark Levinson was to rely solely on its No 523 preamplifier that is reviewed here, this reputation would be safe. In its literature, Mark Levinson declares their No 523 preamplifier "the definitive preamplifier for the analog music lover". 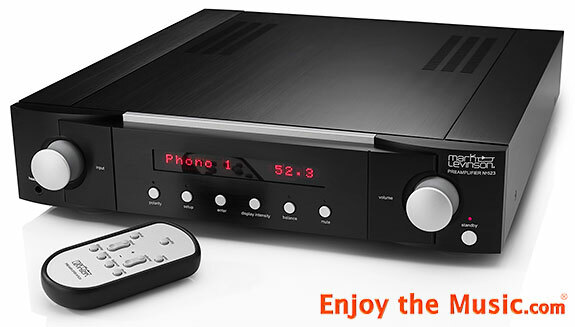 This is because in addition to its six line-level inputs the No 523 also includes a phono preamplifier. Plus, the No 523 also includes a headphone amplifier with a 1/4" jack on its front panel. If one insists on also having a digital-to-analog-converter inside their preamplifier one can opt to purchase the preamplifier one step higher in Mark Levinson's preamp line, the No 526, which also has inputs for a DAC which supports PCM files up to 32-bit/192kHz and DSD files up to SD 5.6MHz (double DSD). Per Mark Levinson's website and in their literature, the No 523 has a "proprietary Pure Path discrete, direct-coupled, fully balanced, dual-monaural signal path". The Pure Path amplifier circuit, it continues, uses a circuit element they call a cascode. This was originally used for bettering the bandwidth of tube circuits in radios, but they use these cascodes not only to improve bandwidth but to also enhance linearity. A cascode uses two transistors to work in tandem to act as a single transistor, rejecting the disadvantages of each and only using its sonic benefits. They call this arrangement a folded cascode. The No 523's gain stage uses pairs of JFET (which by the way, is an acronym for junction field-effect transistors) that Levinson chose because of their low noise and high gain. Although this often has an unwanted side-effect of distortion, the remedy for this is that BJTs (bipolar junction transistors) are used in the circuit. The BJTs have a very low input impedance and very high output impedance, which creates a circuit with the characteristics of outstanding bandwidth and linearity. Mark Levinson asserts that they have created a design with the traits of both sets of devices. They then connect the output of the cascode to another transistor of the opposite "gender". This causes the current to flow the opposite way to "turn around" the direction of the signal current. This folded cascode is something that Mark Levinson calls a "hallmark of the Pure Path circuit", and results in high gain with low noise, wide bandwidth, and excellent linearity. A visiting audiophile saw the Mark Levinson No 523 in my system, but the first thing he did was not ask to listen to music through this preamp, but he instead walked up to the preamp and began to caress it. Once he finished running his fingers across the junction of the top and front panels of its cabinet, he began to operate its volume control. This elicited a huge smile on his face, and he made a comment along the lines of "this volume control feels as good to use as any top-flight preamplifier I've ever seen". I agreed with him. In their literature, Mark Levinson notes that analog potentiometers are inherently problematic, as their mechanical connections are prone to wear, which results in noise. Also, they claim that it is difficult if not impossible to manufacture potentiometers that are measurably identical to each other, causing channel imbalances. There is also something termed "parasitic capacitance" which occurs at different volume settings, which will cause the sound to change as the volume changes. Mark Levinson decided to start from scratch. They designed a volume control built around a complex circuit called an R-2R Ladder. The R-2R Ladder has a string of resistors all with the same resistance (R) which form one side of the ladder, with another set of resistors forming the rungs of the ladder, which doubles the resistance (2R). This circuit takes the current at its input and divides it in half each "rung" of the ladder. This way, different combinations of "rung" currents can be added together, which results in a precisely selected setting at any volume setting. The result is a very accurate volume control. The currents through the rungs are dependent on fixed resistors, which is why there are very tight tolerances, which are closely matched to each other in value. Without any mechanical contacts it cannot wear out. Mark Levinson feels that the volume control on the front panel of the No 523 "is a cornerstone of Mark Levinson Pure Path design philosophy". The No 523 uses Gain-stage JFET pairs. Mark Levinson says that their "Gain-stage JFET pairs have high gain, low noise, low distortion, and because they are encapsulated in the same package, the two devices operate under nearly identical conditions". They use film type capacitors for filtering that have "consistent performance regardless of temperature and frequency" Resistors that are used in "critical gain-setting and feedback locations" use tantalum nitride thin-film elements. This is also used in in "sensitive" military equipment since it is very stable when used under different temperature conditions, is low noise, and is not affected by magnetic fields. When used in audio components, "those characteristics make the sound even more revealing and effortless" Levinson goes on to say that it is "free of the low-level nonlinearities caused by lesser resistive materials as they heat and cool under dynamic conditions". The No 523 cabinet is made from aircraft-grade 6063-T5 extruded aluminum, and is built, according to Mark Levinson, "to exceedingly low tolerances". This is obviously what led the visiting audiophile to have a look on his face as he was on cloud nine when he ran his finger along the edge of the No 523's top and front plates! These days the majority of "preamplifiers" are not actually preamplifiers, but linestages, as they lack an onboard phono-preamplifier. The Mark Levinson is in fact a preamplifier, since it includes what Levinson calls their Pure Phono, which uses the same design principles as their Pure Path design. This does away with any op amps and instead uses a fully discrete design. The phono stage of the No 523 operates exclusively in Class A, and also uses tantalum nitride thin-film resistors and polypropylene capacitors with extremely low tolerances. The Pure Phono stage's two channels are physically separated from each other, and includes balanced inputs. Besides having a fixed-gain Moving Magnet (MM) input with five loading settings, it also has a Moving Coil (MC) section with three gain settings and 10 resistive cartridge-loading settings. The phono section also has an infrasonic filter to filter out the sound of rumble or a warped record. On its rear panel the No 523 has five inputs: two are balanced XLR inputs and three are single-ended RCA inputs. Another very pleasant surprise is the No 523 has a 1/4" headphone amplifier input on its front panel. This is the first time Mark Levinson has included a headphone output in one of their preamplifiers. Since the output stage of the preamp is designed to directly drive headphones via a 1/4" output connector on its front panel, it remains in full class A operation with headphone impedance as low as 32 Ohms. Mark Levinson seemed to make sure that the remote of the No 523 is as nice as the preamp itself, as it is a very nice machined metal device. Compared to many other premium component's remote's, this one is practically an objet d'art. The remote has a palm sized case with a non-slip material on its underside, and an intuitive layout � all in keeping with the first-rate design of a Mark Levinson product. The volume control of the No 523 was a pleasure to use. In the morning when I would change the No 523's power status from standby to on, the preamp would elicit in internal comforting "click", red text would then scroll across its large LED screen to announce that the preamp was ready to play music. It would do so throughout the day without complaint. There were also no complaints from the No 523 throughout the review period. The Mark Levinson No 523 is a pleasure to use. I'm not just saying that because its volume and input selectors located on its front panel's far left and right feel so extravagant when in use. More importantly, the No 523 is very flexible, with just about every function adjustable via its front panel controls or remote. One can customize its input set-up, its volume control can be tailored for each input, it has a power management setting which enables the preamp to automatically shut down, the display can be dimmed or brightened, and one can set any of the outputs of the preamp to be fixed or variable � as a fixed output will be handy if one also uses the No 523 in a home theater set-up. There are also settings on the menu to manage firmware updates which are received either through the rear panel's USB port using a flash drive or through an Ethernet connection. There are settings for external control, network connectivity, its 12V trigger, and it even lets one turn its front IR receiver on and off if one has chosen the unit's rear panel IR input, which in some circumstances avoids interference. I stationed the Mark Levinson No 523 preamplifier on the second shelf of my Arcici Suspense equipment rack, directly above a 350 Watt per channel Pass Labs X350.5 power amplifier it fed via a set of MIT Shotgun S3.3 interconnects. I also had on hand a pair of 400 Watts per channel Merrill Audio Veritas monoblocks that were loaned to me. The Merrill Audio amps are only half the price of the Pass Labs amp, but a heck of a lot smaller and lighter � they have switching power supplies, after all. Merrill Audio components are relatively unknown, but this is not likely to last much longer � because even though the Merrill Audio monoblocks cost about half the price of the Pass Labs amp, they certainly aren't only half as good. Their sound is different than my Pass Labs amp, but they have many sonic characteristics that many audiophiles might prefer, including a very revealing yet musical sound, and that is why I used them for a good portion of this review. In his review of the Veritas monoblocks in December 2013, Jules Coleman agrees with me that these are fantastic amps. Mr. Coleman uses the same brand of speakers that I use, Sound Lab electrostatics. The models I currently use are the DynaStat, his are the newer Majestic 845. Although I also own a set of MIT bi-wire speaker cables, for this review I connected my power amp to the speakers with a rather costly12 foot run of Westlake bi-wire speaker cables. Even though the MIT cables are far from horrible sounding, they cannot compete with the Westlake. Digital front-end components include an Auralic VEGA digital-to-analog converter that is fed via a Furutech USB cable from my music server, an Oppo universal player that spins the occasional silver disc. The analog front-end features a Basis Debut V turntable, Tri-Planar 6 tonearm, and a few different phono cartridges including a Kesiki Purple Heart, Gold Note Tuscany, and for short time near the end of the review period a Van den Hul Stradivarius (review forthcoming). The turntable has its own power supply, providing a pure sinewave to its AC synchronous motor. The phono preamplifier is the single-chassis Pass Labs XP-15. I mentioned that I use MIT Shotgun S3.3 interconnects between the amp and preamp, but for this review I needed longer runs of balanced cables, so I used Merrill Audio ANAP interconnects that have Cardas XLR connectors. Although not cheap, they are reasonably priced, and in addition to being very satisfied with their very transparent sound I am grateful to Merrill Audio for loaning them to me for this review. I'm not going to lie; I didn't notice any sonic fireworks when I began my serious listening sessions with the Mark Levinson No 523. But this is actually a good thing. Perhaps a better way of saying this is that no characteristics jumped out and grabbed my attention once this preamplifier was fully broken in. Instead, I heard, or rather didn't hear, a component that practically disappeared into the signal chain. Over the years I've heard and read more discussions in regards to the proverbial "straight wire with gain", in more conversations among audiophiles than I care to admit. In reality, of course, I've never heard such a thing. But there are some components that come very close to this ideal, and I'm going to proclaim the Mark Levinson No 523 preamplifier as one of them. It performs its preamplifier duties as it sonically gets out of the way of the signal that the source provides to the inputs on its rear panel. I imagine that this must be a much more difficult engineering feat than it seems, as I've heard preamplifiers that cost much more than the No 523 that did not come close to this type of disappearing act. Music is emotion. Music is passion. Music is beauty. But it should not be the task of the preamplifier to create this emotion, passion and beauty. These traits must originate from the source. And so I was very impressed that one of the first traits I noticed during many of the long evenings I spent with the Mark Levinson No 523 in my system was its ultra-silent background. Even with the volume at a healthy level there were a number of times when I was between selections and I couldn't tell whether the preamp's mute was in its on or off position. This silent background led to this preamplifier displaying a host of positive traits us audiophiles not only admire, but require when spending anywhere near the asking price of the Levinson No 523. One of these positive traits, is of course, being "true" to the source. But it was obvious to me that the No 523's silent background was one of its characteristics that was responsible for this. Events such as when a track begins with a sharp edit, enabled the music to fill this space with much more impact. And when this music happens to be a fiery rock tune, it violates the empty space � which can be very cool when listening to, for example, a good pressing of a Led Zeppelin LP. I put on Zeppelin's III album (again). After the short sound effect intro, BAM! "Immigrant Song" starts. How can a song that I've heard since I was a pre-teen make me jump when it enters? Using the Mark Levinson No 523 in the system, that's how. This preamp's black background aids in increasing not only the impact, but dynamics, both micro- and macro-, along with the feeling that one is hearing exactly what the source of the system is providing to its inputs. This is especially true when playing music that features acoustic instruments and voices recorded without, or at least recorded with very little, added studio effects. Recordings of large orchestras or small ensembles with or without vocals recorded in a hall, or a group of jazz musicians or other musicians playing acoustic instruments recorded in the studio demonstrated the No 523's ability to be true to the source, and enabled groups of instruments and vocals to take on a much more realistic mien, which translated into a more realistic sounds coming out of the speakers. Again, the No 523 got out of the way and let the music speak for itself. In the No 523's literature and on its website Mark Levinson claims that the sound of this preamp is "revealing and effortless". Earlier I detailed the constituents of this preamps innards, and although all audiophile components come with manufacturer's hyperbolic claims, Mark Levinson isn't exaggerating when it comes to how easy it is to "see into" a recording, and how this preamplifier does not mess with the signals that pass through it. And again, all this seems to stem from the silent background that the music floats upon. I played both the SACD file and the vinyl Classic Records reissues of Miles Davis' Kind Of Blue quite a few time during the audition period. The first track "So What" proved how the Levinson No. 523 was able to separate each musician's instrument in the soundstage, and as my reference system uses rather large electrostatic speaker panels these instruments seemed so far away from each other it was as if I could measure this distance with a yardstick. Yet the sound of the reverb that is added to the instruments bleeds into the space between each of them, adding to the sense that I can see with my ears into the indoor space in which the musicians were laying down these tracks. Miles' horn is mixed front and center, with the added reverb filling the space that is layered upon the black background. The sonic impression of studio ambience that also fills the spaces behind and to either side of each speaker, creates a mood like none other. There are not many jazz lovers or audiophiles that need reminding which musicians joined Miles Davis on this session, but just for kicks I'll mention that this monumental session was with a staller line-up that included Miles's trumpet, along with Julian "Cannonball" Adderley on alto sax, Paul Chambers on bass, Bill Evans on piano with Wynton Kelly credited on one tune, Jimmy Cobbs on drums, and none other than John Coltrane on tenor sax. Believe it or not, there are some who live on our planet that might not have heard this record, and even some audiophiles who have not heard it on their system. If you are one of these people, I suggest you take care of this. Immediately. This celebrated album has been analyzed countless times by countless people. But one hardly needs to read what music critics and academicians think of it to enjoy it, that's for sure. This is primo music making with some of the greatest modern jazz musicians of that time. The track "So What" has an almost impressionistic first few bars, where the musicians, especially Miles, cites styles from the jazz greats from the past, not directly quoting others, but taking their lead to create a style that's all his own, and hints of what is to come in the future. On the surface this music-making might sound nonchalant, even relaxing. But when one truly listens the genius that was recorded during these sessions rises to the top. Even though I've heard this recording hundreds, maybe even thousands of times, with the Mark Levinson No 523 in the system I felt as if I could discover new ideas and intricacies in the album that I hadn't heard before. I don't mean to infer that the No 523 preamp has an excessively detailed sound, or heavens' forbid, sounds anywhere near etched. What I'm trying to convey is that the No 523 let me hear deep into the recording, my mind following a sonic path that was akin to a sonic maze, its first-rate sound quality acting as a guide. Which brings us to the No 523's reproduction of sounds at the very top and very bottom of its frequency range. When playing any type of material through this preamp, I would certainly notice if there were any anomalies present in either the lowest of lows or highest of highs, it is just that the No 523 didn't bring those frequencies to my attention -- they were just "there". Which is precisely what I meant when I said that there were no characteristics of the No 523 that jumped out at me when I began my evaluation. Yes, this preamp's treble is as extended as the recording demands, and my speakers can reproduce. Its bass goes as deep as the recording demands (and my system can reproduce). As I continued to play LP after LP, disc after disc, file after file, my feelings were confirmed � this preamp was nearly sonically invisible. It performed not as great preamp should, but as a great, upper high-end preamp should. I spent a good amount of time with headphones connected to the Mark Levinson No 523's front panel headphone jack. To audition the headphone amp, I used the best headphones I had on hand -- a set of planar magnet OPPO PM-1 headphones and the Grado's PS-1000e, which have dynamic drivers. Both sets of �phones made it apparent that the No 523's headphone output is hardly an afterthought. That the sound quality of the headphone output is very much like the sound of the No 523 when used as a preamp is no accident. The headphones are not driven by a separate headphone amp, but by the No 523's main outputs, eliminating the need for a separate headphone amp, and that is what contributes to the quality of the headphone output's sound. No, using the headphone output doesn't climb the same heights of sonic refinement as when using the preamplifier's outputs to drive a power amp, but still, this headphone output offers more than just convenience, it has a first-class sound. Let's not forget about the Mark Levinson No 523's phono preamplifier. First of all, I was quite surprised at this onboard phono preamp's flexibility. And of course its sound quality! As with its headphone amp, the phono preamp that is in the Mark Levinson No 523 is hardly an afterthought. As I said in the introduction of this review, this phono preamp uses the same design principles as the No 523 itself, with a fully discrete design running in Class A, with tantalum nitride thin-film resistors and polypropylene capacitors. Mark Levinson doesn't publish many specifications in regards to its phono preamplifier, but I have no doubt that due to its two channels being physically separated from each other, its channel separation specifications are most likely very impressive. I use low-output moving coil (MC) cartridges, and I found it very easy to adjust the phono preamps gain settings and loading options. It was quite a simple task, as I used its front panel input knob to scroll through the menu options, and then used it's enter button to select the desired options. The phono preamp's menu choices include opting for either an MM or MC cartridge, resistive and capacitive load options, balance, either high or low gain, and its infrasonic filter. As far as its sound quality is concerned, as with the headphone amp, it shares many of the positive sonic traits of the main preamp section. Even though I have been spoiled by my reference phono preamp, the $3500 Pass Labs XP-15, I was very impressed. Although the No 523's phono section does not sound as opulent as my XP-15, it sounds much better than simply "decent". Mark Levinson's phono preamp wasn't embarrassed by the outboard Pass Labs. The deciding factor of whether or not one is satisfied with the sound of the Levinson's phono preamp will most likely depend on how upscale one's turntable/tonearm/cartridge set-up is. My analog front-end is very revealing and so it certainly appreciates the quality of my Pass Labs unit. The No 523's phono preamp was not as detailed and dynamic, but there is no question that the No 523's phono section is a true high-end circuit, and it sounds it. Even without looking at its specifications I could hear it is very low in distortion, has a great signal-to-noise ratio, and as a bonus is flexible enough to support any phono cartridge one is likely to use. I listened to quite a few records using the Levinson's on-board phono preamp, and after a time I began to not only admire its clean sound, but also its extended frequency response, and better yet, its lack of any nasties or excessive noise in the upper mids and treble that would imply that it couldn't handle the low output of the cartridges that I connected. I would dare to say that the phono preamp in the No 523 is as good as most $1500 to $2000 outboard solid-state phono preamps, and even better than some of them. Mention "Mark Levinson" to many non-audiophiles, and only a few will recognize the it as the name of the man. But the majority are going to recognize it as the excellent audio company that bears his name. This is in some part due to Mark Levinson being owned by the large Harman International Industries, and their mainstream presence. Still, there is no question that Mark Levinson's high-end components are familiar to many because of their reputation. Many Lexus owners, too, are familiar with Mark Levinson, as their audio systems are an option in most of their cars. After my long audition, the Mark Levinson No 523 preamplifier has proven to be another high-quality high-end product made by this venerable company. It is a very flexible, great sounding, and luxurious looking preamplifier that skimps on nothing � not internally or externally. I can't imagine any audiophile, young or old, finding anything lacking in the No 523. It may be a luxury product to most, but there are likely many seasoned audiophiles that will find this $15,000 preamplifier to be a relative bargain. That's because one gets lots for their money with this solid-state preamplifier, which includes not only a first-class linestage but also an excellent phono section and headphone amp. I not only recommend an audition; but if one has the scratch, I also recommend purchasing a Mark Levinson No 523 preamplifier.